Badiraguato, Mexico: The downfall of Joaquin “El Chapo” Guzman has done little to diminish his drug cartel’s power, but locals say it has had a devastating effect in one place: his remote and lawless hometown, Badiraguato. “El Chapo” was born 61 years ago in this small, dusty town in Mexico’s Sierra Madre mountains, in the northwestern state that would give his multi-billion-dollar global drug empire its name: the Sinaloa cartel. Guzman, who was found guilty Tuesday of trafficking tonnes of drugs to the United States across a quarter of a century, now faces the likelihood of life in jail at his sentencing on June 25 in New York federal court. But he remains a hero in Badiraguato and the surrounding county, where residents remember him as a larger-than-life figure who ruled his fiefdom with largesse and brought a now-lost prosperity the Mexican government never provided. “Now that Mr Chapo’s gone, there’s more poverty. People have to leave here to look for work, because things are pretty tough,” says Jorge Valenzuela, a resident of Potrero de Bejarano, a small village at the far edge of the county. The air is thick with tension in this region, where the police are nowhere to be seen and men with AK-47s and walkie-talkies patrol the countryside in armoured pickups. Many wear caps stamped with the number 701 — a reference to the spot “El Chapo” reached on Forbes magazine’s list of the world’s richest people, with an estimated fortune of $1 billion. The mountains are dotted with marijuana and opium poppy fields. Silence is the rule: locals’ lips are generally sealed when it comes to talking about the area’s number one industry. But get them started, and they gush praise for Guzman. “He gave people money to buy things, gave them seeds to plant (drugs). Now there’s nobody to do that,” Valenzuela told AFP. Together with the states of Chihuahua and Durango, Sinaloa forms Mexico’s “Golden Triangle,” a region rife with marijuana and poppy fields, and home to many of the country’s most notorious drug traffickers. “El Chapo” grew up in a tiny hamlet of about 100 people called La Tuna, high in the mountains. He once told Sean Penn in an interview for Rolling Stone magazine — a meeting that infamously led to his downfall — that he grew up “very humble, very poor.” He went into the drug business at 15 because there were no other jobs, he said. Nine in 10 residents of Badiraguato live in poverty or extreme poverty, according to government figures. It is the poorest county in Sinaloa. It also has the fewest paved roads in the state — though there are plenty of dirt ones criss-crossing the mountains, leading to the fields. With “El Chapo” gone, the local economy has suffered, small business owners say. “It used to be there were always people coming and going, transporting stuff up into the mountains in 4x4s. Now it’s dead calm,” says Jaime Laija, who owns a restaurant on the main road into Badiraguato. He, too, describes Guzman as a generous benefactor. “He used to help the sick, give them money and things,” he says. Not everyone in Sinaloa is mourning, however. Guzman’s extradition unleashed an initial period of instability in the state, as his sons waged war with his cartel co-founder, Ismael “El Mayo” Zambada, for control, leaving a trail of bodies in their wake. But the situation has now stabilised under Zambada. And the brutal violence “El Chapo” sowed in the state has actually diminished, say local authorities. “Fortunately there has been a downward trend. After (Guzman) was extradited (to the United States), the cartel fragmented, but now things have stabilised and the crime rate is trending down,” says Cristobal Castaneda, the state’s public security secretary. 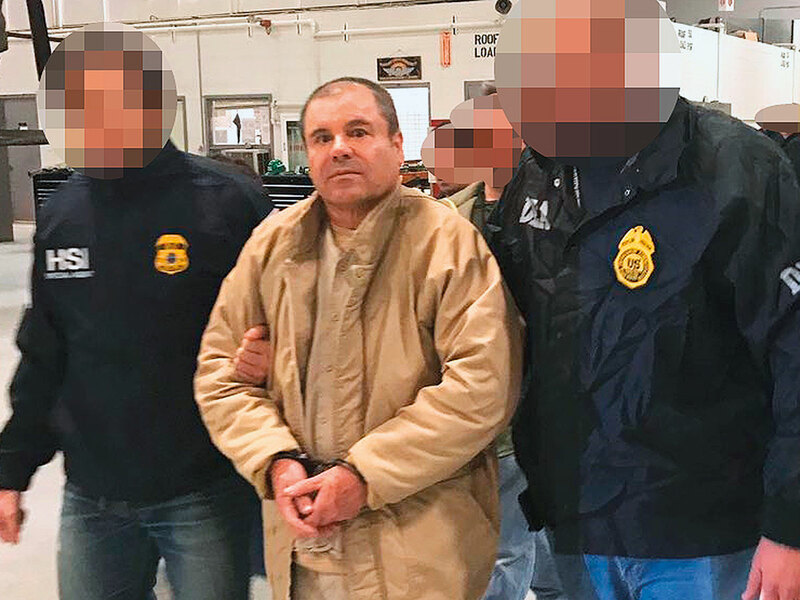 However, while taking out “El Chapo” is “a great moral victory,” his conviction changes little on the ground, says Mike Vigil, former head of international operations for the US Drug Enforcement Administration. “The Sinaloa cartel will continue to operate the same,” he told AFP. “They are just as powerful as ever,” he said. However, that is not the case in forgotten Badiraguato — where many are hoping “El Chapo” will somehow pull off his third prison escape.